For many of us, summer is the best time of the year, what with all the BBQs, family reunions, muddy slip and slides, refreshing popsicles and delectable ice cream cones. For homeowners in the Pacific Northwest, summer’s bright, sunny days seem to justify the area’s months of gray clouds and rain. However, all the good times summer brings can also wreak havoc on your flooring. Muddy feet, food stains – these are the threats that summer has in store for Portland flooring. Wood flooring is beautiful and easy to clean, but it’s not the best summer flooring because it often stains if left wet – a common occurrence in summer, when tiny wet footprints often tell tales of summertime fun. Carpeting is out because it holds onto stains and allergens. Carpeting can also retain moisture if installed improperly – which can lead to the growth of mildew and mold in damp locales like Portland. It includes a urethane coating on top, which makes cleanup simple – just sweep and mop. This urethane coating also helps protect against stains. Enjoy a worry-free summer, knowing that those ketchup or red wine stains won’t set in. It is comfortable on bare feet, unlike ceramic tile. 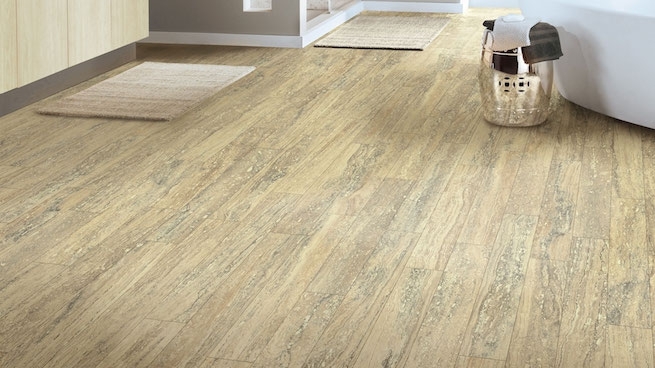 If you love to pad around the house barefoot in the summer, vinyl is a great choice for flooring. Portland only gets three or four months of nice weather – let your feet enjoy it with vinyl floors. Vinyl flooring is available in a broad range of designs and colors. Today’s vinyl flooring manufacturers use computers to create surface designs and textures that can trick anyone into thinking a vinyl floor is actually made up of wood planks or ceramic tile. Glasses break less often when dropped on vinyl flooring. Portland families appreciate the fact that vinyl can absorb some impact. Glasses oftenbounce off of vinyl floors without breaking. Because there are many different grades of vinyl flooring, Portland homeowners should check with their local Portland flooring store to ensure that they’re buying a brand that will look good even after decades of high-traffic use.